What’s a sporting event without an official watch? 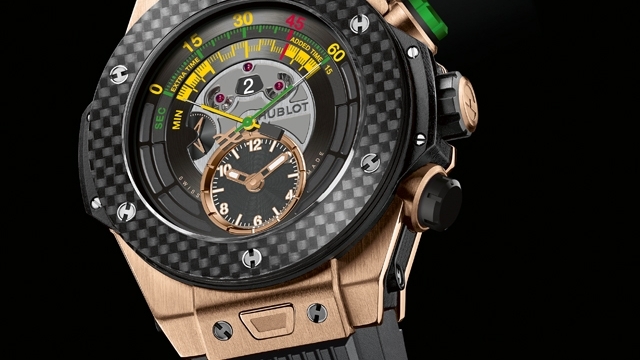 Hublot have just announced the official watch of the 2014 FIFA World Cup in Brazil. It’s a chronograph, but bi-retrograde (a first for the brand) and, being designed for football, has an easy to read and intriguing indicator about the status of the match – whether it’s in the first half, second half, or in extra time. The result of 18 months of R&D, this commemorative watch contains the new automatic HUB1260 manufacture movement: a bi-retrograde movement with central chrono comprising of 385 components. This special edition is in the “Big Bang Unico” 45.5mm case, with the bezel secured by the 6 H-shaped screws. As mentioned, this is Hublot’s first bi-retrograde display. So how does it work? When the chronograph is started, the second and minute hands move from left to right in an arc of 45 minutes (one half of a football match), with an area for 15 minutes (extra time) adding up to 60 minutes. There are two push-buttons on either side of the crown for START, STOP and RESET. The pusher at 2 o’clock is also used to show the period of time selected from the following four options: 1st half, half time, 2nd half and end of match, as indicated by a window in the centre at 12 o’clock. A sub dial at 6 o’clock shows the time, whilst the seconds are shown via a small counter at 9 o’clock with a three-spoked hand. The power reserve is approximately 72 hours. The national colours of Brazil are represented on the dial via the yellow retrograde display with minute hand, and green retrograde display and second hand, and there are World Cup references on the caseback. The strap attachment features the “One click” system which allows the wearer to switch between straps, but the watch itself comes on a natural rubber strap which either has a black PVD titanium deployant buckle with 18K King Gold, or carbon fibre insert. 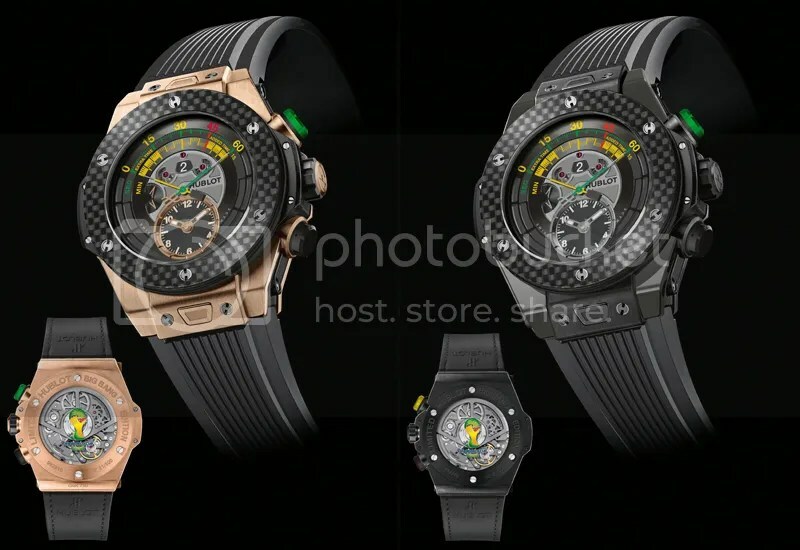 It is available in two versions: an 18K King Gold version in 100 pieces and a black ceramic version, both with a carbon fibre bezel, and the latter limited to 200 pieces. The King Gold version has a black rubber bezel with the Hublot logo and the black ceramic one, a black PVD titanium bezel with black rubber and logo. The watch is water resistant to 100 metres, but perhaps playing underwater football is inadvisable. 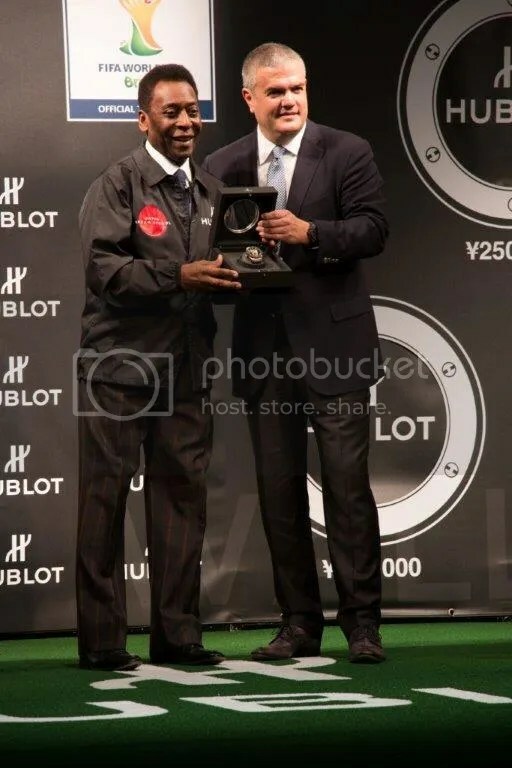 The ‘Soccer Bang’, as it is already informally called, was launched by brand ambassador Pelé and CEO Ricardo Guadalupe.